Almost every movie series is a “universe” nowadays. It's not always superheroes. Sometimes it's a shared universe revolving around... paranormal investigators from Connecticut? Is the “Conjuring-verse” really a thing? I guess so. Kicking things off in 2013, “The Conjuring” told the true story of paranormal investigators Ed and Lorraine Warren from Monroe, CT. Locals know them well and the rest of the world got to know them as a somewhat fictionalized versions of themselves that got transported to the big screen. The movie was a deservedly massive hit and, best of all, it was scary. The film is a new classic of the horror genre. It wasn't going to end there. 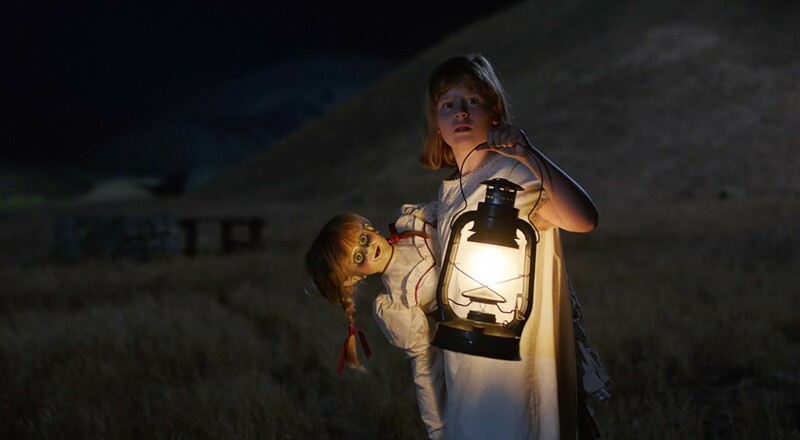 A spinoff followed called “Annabelle;” it was appropriately critically reviled as it felt somewhat neutered compared to “The Conjuring.” It was completely fine if somewhat cliché-ridden. “The Conjuring 2” turned things back in the right direction because you realized how fantastic Ed and Lorraine are as characters. And actors Patrick Wilson and Vera Farmiga embodied them so well. Now we're back to Annabelle, the real-life Chucky, in a prequel to a prequel that no one really asked for but here it is. And it's thankfully nowhere near terrible. “Annabelle: Creation” has decent characterizations, doesn't follow the formula, and offers enough fun thrills to make it worth your time. “Annabelle: Creation” is successful most likely due to director David F. Sandberg's who conjured up his own feature length debut with last year's clever horror flick “Lights Out.” He brings the same ingenuity here and it shows. Set years before the events of “Annabelle” the film follows a small group of orphan girls who seek refuge in the home of a couple who years prior lost their own little girl in a car accident. Samuel Mullins (Anthony LaPaglia) is the guy who created the creepy Annabelle dolls, whom he had named after his daughter. His wife Esther (Miranda Otto) is bedridden and hides behind a mask for initially unknown reasons. The girls are accompanied by Sister Charlotte (Stephanie Sigman) who is one of the stronger horror characters of recent memory. But the real stars here are the young girls who dominate the film's story. Janice (Talitha Bateman) is a girl with polio who after some exploring finds the Annabelle doll locked away in a room she shouldn't be going into. Linda is her friend whom she quickly forms a sisterly bond with. (Linda is played by Lulu Wilson who is sort of the Jamie Lee Curtis of child actors having previously appeared in last year's “Ouija: Origin of Evil” and 2014's “Deliver Us From Evil”). All hell breaks loose after that. Things begin to go bump in the night and it becomes obvious that the Mullins are holding a terrible secret and the doll might be the vessel for something extremely sinister. “Annabelle: Creation” doesn't quite feel like it's predecessor. Even if it has some haunted house movie elements, it feels somewhat fresh. If anything the film has a Foreign gothic horror vibe and reminds me more of something like “The Orphanage” or “The Devil's Backbone.” The film earns it's scares and even if I didn't find anything outright too scary, the look of the sinister being – as first seen in the first “Annabelle- is perfectly designed and completely terrifying. The performances here are also extraordinarily above average for this type of film which is amazing considering a majority of the cast are children and young teens. Screenwriter Gary Dauberman wisely takes a different approach from the first film. I really like the period setting; it's refreshing to not see characters relying on smart phones with no service or other means of “this isn't working at the moment” technology that riddles most modern horror films. The story is also almost completely set in the Mullins' home. You'd think the same location would eventually get dull, but Sandberg is always keeping things interesting. Like other films in this universe, the film doesn't rely on graphic violence, which is surprising given all four film's R ratings. The films are definitely disturbing. “Saw” they are not.